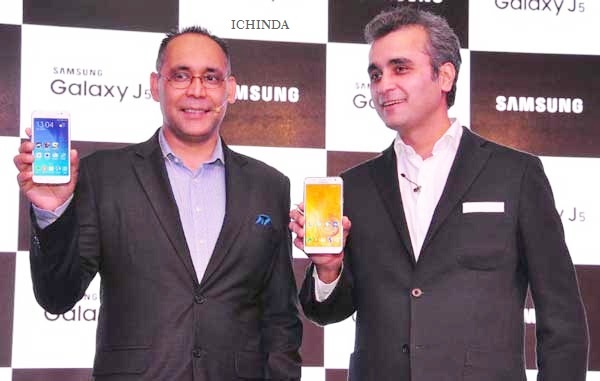 To fulfil the dreams of mid-range buyers, Samsung has launched two smartphone from new “J” series, the all new Samsung Galaxy J5 and Samsung Galaxy J7 in India priced at Rs 11,999 and Rs 14,999 respectively in Black, White, and Gold colour option. Samsung Galaxy J5 and Samsung Galaxy J7 will be available online through Flipkart from 24th July. The pre-booking is on from Thursday. Samsung Galaxy J7 and Samsung Galaxy J5 first launched in China priced at at CNY 1,798 (Approx. Rs. 18,400) and CNY 1,398 (Approx. Rs. 14,300) respectively. The all new Samsung Galaxy J7 supports 4G LTE, Dual-SIM, Micro Sim with 3G, Wi-Fi 802.11 b/g/n, Micro-USB, A-GPS, Bluetooth 4.0, 3.5mm audio jack, GPS, Glonass, and FM radio comes with a bigger 5.5-inch (720×1280 pixels) HD TFT display promising crystal clear wide-angle view perfect for your multi-tasking. While The all new Samsung Galaxy J5 supports 4G LTE, NFC, Dual-SIM, Micro Sim with 3G, Wi-Fi 802.11 b/g/n, Micro-USB, A-GPS, Bluetooth 4.0, 3.5mm audio jack, GPS, Glonass, and FM radio comes with a bigger 5-inch (720×1280 pixels) HD TFT display promising crystal clear wide-angle view perfect for your multi-tasking. At last few honest word, Samsung Galaxy J5 and Samsung Galaxy J7 going to rule the mid-range market in India. What you think? Please be open to give your view.